John Volpe Edward J. McCormack, Jr. 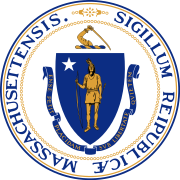 The 1966 Massachusetts gubernatorial election was held on November 8, 1966. Governor John A. Volpe was reelected to a four-year term. He defeated former Attorney General Edward J. McCormack, Jr. in the general election. This was the first election held since Governor's Term of office was extended from two to four years. Francis Sargent was unopposed for the nomination. Francis W. Sargent defeated Joseph E. McGuire by 199,939 votes. It was the last general election in which the Governor and Lt. Governor were elected separately.